Keep God first, work for everything that you want, and your word is your bond. Those are the three principles that were instilled in Aaron Rouse at a young age by his grandfather, a U.S. Army veteran. He held these principles true to himself while growing up as a blossoming football player, and they are the same ones he keeps close to his heart in a new dimension in the political realm today. Rouse, the former Virginia Tech football player from 2002 through 2006, is running as an At-Large candidate for the Virginia Beach City Council, where the election is just one day away on Tuesday, November 6. It’s been an unpredictable and even unbelievable journey to where Rouse is now. During his childhood, Rouse’s mother was constantly working jobs, and his father was and still is incarcerated. Rouse’s grandmother, who provided many of the family needs, passed away at the young age of 49 from breast cancer. Rouse was forced to mature at a young age with the advice from his grandfather. He would wake up in the morning before school started and pump diesel in the school buses. Nights were spent working various jobs from Target to Farm Fresh to Food Lion, and even McDonald’s. In between all of that, Rouse biked to football practice, a total of about 10 miles to play the sport he loved. “I would best describe it as God has a plan for all of us,” Rouse said. “The way I was brought up, I wouldn’t wish it on anyone else. Rouse’s determination off the field lent a hand to results on the gridiron. At First Colonial High School in Virginia Beach, the star-studded athlete made a name for himself. Frank Beamer was the first coach to come calling, and the rest was history. Much of Rouse’s platform today for City Council is centered around an emphasis on education, where teachers are valued, as well as first responders and the military. Without those influences inside and outside the classroom, Rouse doesn’t know if he would have made it out of his poverty-stricken community. After redshirting his first year, Rouse had a breakout redshirt freshman season at Virginia Tech. He closed the year by tallying 46 tackles and forcing one fumble while playing in all 13 games. While fans adored his play inside Lane Stadium, there was much going on behind the scenes that the Hokies faithful didn’t know about. Rouse had a son, Isaiah, and knew he couldn’t be absent to his son like his own father. Rouse didn’t have anyone to rely or depend on growing up, and didn’t want to put Isaiah through the same circumstances that plagued himself. Beamer and Rouse had an agreement during the summer, too. Rouse was allowed to go home and be with Isaiah and his family, as long as he passed the summer conditioning test when he came back. Sure enough, Rouse would spend the days working concrete and the nights training to maintain tip-top football shape. He passed the conditioning test with flying colors, persevering through the barriers that existed. 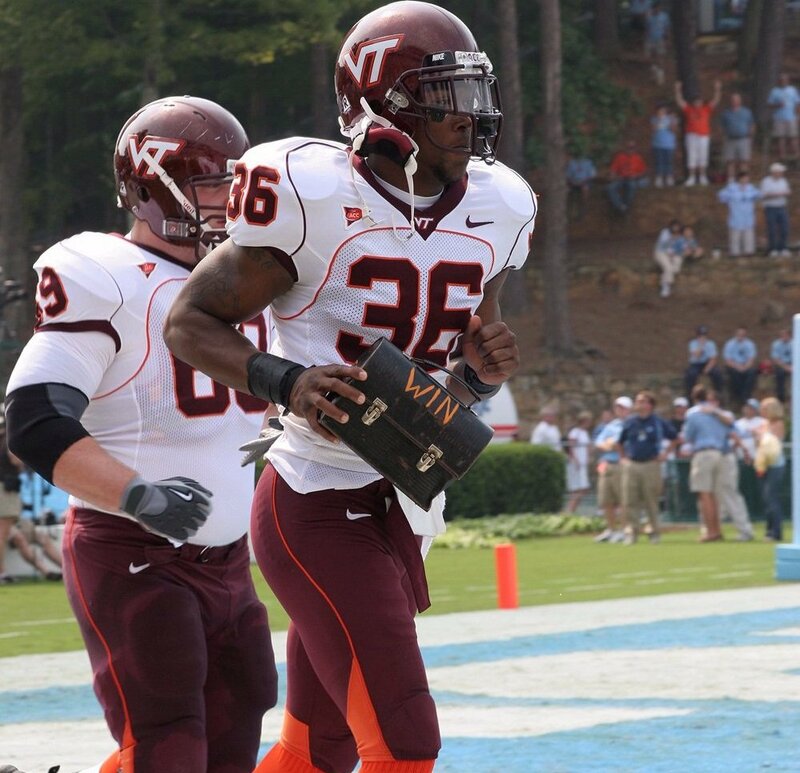 The hybrid linebacker/safety finished his Virginia Tech career with 217 tackles, four forced fumbles, and five interceptions. Rouse was drafted in the third round of the NFL Draft by the Green Bay Packers. The 6-foot-4, 223-pounder played for the Packers from 2007-2009 before bouncing around with the New York Giants and Arizona Cardinals because of injuries. Rouse eventually retired from football after a bad car accident, but that wasn’t the end. It was just the beginning. Rouse began attending General Assembly meetings in Richmond and conversed with those on both sides of the aisle to understand the dynamics of politics. During this time, Rouse also returned to Friendship Village and the other communities he frequented to start book bag collections for the kids there. “From Seatack community, Friendship Village, Twin Canal, Lake Edwards, there was so many other kids who saw, ‘Wow, he made it out from here, from poverty. He made it to college, and we’ve seen him play on TV,’” Rouse said. “I always came back and just spoke to the local elementary schools, at the high schools, and middle schools, and football camps to let the kids know that it’s all about education. Rouse’s collaboration with local businesses prompted the idea from one of the owners that Rouse should start a non-profit organization. Fast forward to 2017, and Rouse’s House received its non-profit designation. The passion that Rouse exhibits for Virginia Beach’s next generation of leaders fuels his candidacy today. When Rouse announced that he was running for Virginia Beach City Council earlier this March, he recounted his own past to think about the opportunities that escaped him. That’s the reason why Rouse wouldn’t invite Kam Chancellor, Bruce Smith, or Michael Vick to any of his community initiatives. Instead, he brought business leaders, doctors, teachers, lawyers, and police officers as examples before the children. That’s not to say some former teammates haven’t joined the campaign along the way. Rouse has received endorsements from Governor Ralph Northam, a variety of firefighter, police department, and education organizations. He’s received the support of his former coaches, Beamer and Bud Foster. There’s even been the recent endorsement from his good friend, Pharrell Williams. Through it all, Rouse has stayed grounded as a father with Isaiah, now 15, and his 5-year-old daughter Aaliyah. Rouse speaks about his children with a different tone of voice, one of a father’s delight, warmth, and tenderness. He’s passing those same principles of keeping God first, working for everything that you want, and your word being your bond to Isaiah and Aaliyah, and he hopes he can use his position on the City Council to extend it far and wide to the city of Virginia Beach beginning November 6. I would vote for him!! Great person, father and community leader. I hope he wins! Hard Smart and Tuff. Great life lesson. Great article. Proud of him as a Hokie and proud to be a Hokie! He’ll keep my vote as long as I believe he’s trying to work across aisles, which includes the different cities as well as parties. Great story, thanks! Wishing Aaron the best on Tuesday! Anyone in VB, vote VT! Great story. Hope he gets a big “WIN” !!! Great read about a inspirational young man. I wish every person with any kind of political aspirations was so well grounded and had principles like Aaron does. does he have a year of eligibility left…? Great story and guy. Sure hope he wins tomorrow. What exceptional character! Makes one proud to be an alum. Makes you wished you lived Va. Beach . Great VT Football player but a better man.l hope he wins and this is a very good article. Good for Aaron. And a far cry from Mark Whitaker, thankfully. Wow! Thanks for the article! I’m definitely voting for him tomorrow. Fine job again of highlighting former players and what they are into now. Enjoy your articles – and best to Aaron Rouse! Outstanding. We need more like him! The cronyism and back room politics of the current VA Beach City Council should help him. I’m voting for anyone not linked to the planning commission or the Cavalier (Bruce Thompson) deals. Best of luck to Aaron! Great football player but better father and man! Well timed article, get those Hokie voters to the polls. Great insightful article Cory. Appears Aaron has a promising political career in front of him. I wish nothing but the best for Aaron, and for the people of Va Beach. We all need more people like him running. I just hope politics don’t corrupt him. Most folks who are in politics long term, get corrupted. Simply awesome. Making the world a better place. Let what Aaron’s doing inspire us all. Was in Va Beach on vacation in August and his yard signs are everywhere. Should win.